The Equality Illinois Political Action Committee supports Susana Mendoza for the Democratic nomination for State Comptroller and the re-election of 24 incumbent state legislators who have supported measures advancing LGBT equality in Illinois. 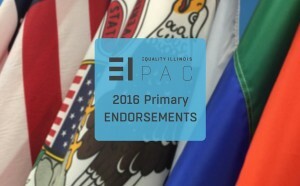 EI PAC, the political arm of Equality Illinois, is the only statewide organization dedicated to securing and defending the rights of LGBT through engagement in the electoral process. A second round of endorsements will be made shortly.